The crew of the shuttle Atlantis plans to spend today wrappingup work at the International Space Station (ISS) in preparation for departuretomorrow. The seven STS-129 astronauts, led by commander Charlie Hobaugh,have had a busy week docked at the orbiting laboratory, where they've completedthreespacewalks and complicated robotic work to deliver about 15 tons of sparesupplies. They plan to spend Tuesday transferring the last of their cargo tothe ISS and loading any equipment that needs to be carried back to Earth. The home-boundspaceflyers will say goodbye to the five long-term station residents in theafternoon and close the hatches between the two vehicles at 12:28 p.m. EST(1728 GMT). Atlantis is set to undock from the outpost early Wednesday. 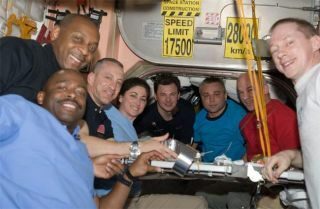 "We expect a busy day onboard the space stationtomorrow to get all our finalitems transferred and the hatch closed on time," lead station flightdirector Brian Smith said Monday. "The mission is proceeding well." Atlantis will be leaving with one more person than it camewith, as station flight engineer Nicole Stott, a NASA astronaut, is due to endher three-month space tenure and fly home with the STS-129 crew. "One of our primary goals is bring Nicole Stott back,so we will not close the hatches if at all possible without her on the shuttleside and we?ll bring her home," STS-129 mission specialist Mike Foremansaid in a preflight interview. The shuttle astronauts must pack up the spacesuits used forthe mission's spacewalks and move them back to the orbiter, as well as checkout the tools they will need for undocking and returning to Earth. One spaceflyer especially eager to come back to the groundis mission specialist Randy Bresnik, who made his first voyage to space on thistrip. Early Sunday, Bresnik's wife Rebecca gave birth to the couple's secondchild, a girlnamed Abigail. The astronaut has had to balance focusing on his missionwith missing his family back home. In fact, his wife was laboring to give birthwhile Bresnik was making his first spacewalk. Despite the potential fordistraction, the spacewalk went off without a hitch and mission managers saidhe performed admirably. "Randy was completely focused on the mission and that'sexactly how it should be," Smith said. The STS-129 spaceflyers will also get some time off today torest up for the final leg of their space journey. Before they close the hatcheson the station they will take part in a change-of-command ceremony to mark theend of the station's Expedition 21 mission and the beginning of Expedition 22. Normally these ceremonies happen just before the outgoing ISScommander leaves, though Expedition 21 commander FrankDeWinne of Belgium will not return to Earth until Dec. 1. DeWinne requestedto hold the event early, and transfer control to his replacement, NASAastronaut Jeff Williams, while Stott was still onboard. "Frank's idea made a whole lot of sense," Smithsaid. "It's how he wanted to do it, so we said, 'Sure.'" DeWinne, the first European Space Agency astronaut to serveas station commander, also had the shortest tenure of an ISS captain, with atotal command time of about six weeks.